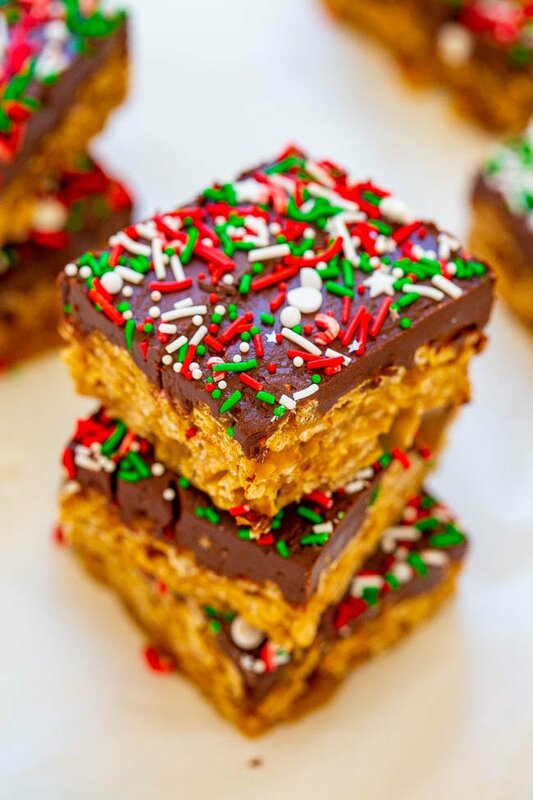 Holiday Special K Bars – Super chewy, gooey, FAST, easy, no-bake cereal bars loaded with peanut butter, chocolate, and sprinkles!! Like scotcheroos but with Special K! Great for impromptu hostess gifts or cookie exchanges because they’re irresistible!! 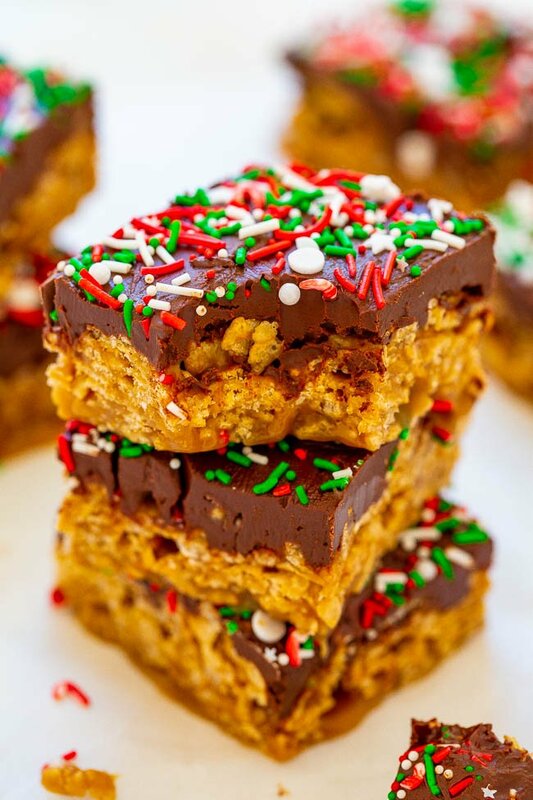 These easy, no-bake cereal bars are extremely chewy, dense, gooey, have peanut butter undertones, and are topped with semi-sweet chocolate and sprinkles. They’re just like scotcheroos, but made with Special K rather than Rice Krispies cereal. If you’re a fan of any bar-type snack/dessert resembling Rice Krispies Treats, I have a feeling you will love these. There’s no marshmallow but the gooeyness of the brown sugar-butter-peanut butter sauce that’s poured over the Special K is similar in a way. Just like there are some people who are really, really into cheesecake or really into brownies, I’ve come to realize there are people out there who love the chewy-gooey aspect of cereal bars and are really into them. I am definitely one of those people. I would rather have one of these than many so-called ‘fancy’ desserts that take hours (or days) to make. I have dozens of cereal bar recipes for this very reason. No-bake, Chewy, Gooey, Caramely, with Peanut Butter, Special K, Cereal, Marshmallows. You get the point. Simply boil together butter, brown sugar, corn syrup, add peanut butter, vanilla, and salt before pouring the mixture over Special K Cereal. Super fast and simple. I added a basic melted chocolate chip topping because that’s how my Grandma made these bars and this is her recipe. Or try this topping. Super pretty but easy and loaded with rich flavor. Then I added holiday sprinkles since it’s that time of year. Tis the season to get festive and sprinkle away. The Special K Bars make great little impromtu gifts and work well in cookie exchanges in decorative bags because they keep fresh for a long time. I have stored them at room temp for about a month and I have also stored it in the fridge for even longer, like two months. Maybe not ideal, but they were fine. As always, use your best judgment, but I am just sharing my personal findings about how long the bars keep. Reindeer Chow – A holiday twist on classic Muddy Buddies that’s easy, ready in 15 minutes, and perfect for hostess gifts or cookie exchanges! Chex, chocolate, peanut butter, pretzels, M&Ms, and sprinkles make it irresistible! Bars – Line a 9×13-inch pan with aluminum foil for easier cleanup and spray with cooking spray; set aside. To a large bowl, add the Special K; set aside. To a medium, high-sided stockpot, add the butter and heat over medium-high heat to melt. After the butter is mostly melted, add the brown sugar, corn syrup, and whisk to combine. Boil for 3 minutes, stirring intermittently. Remove the pot from the heat, add the peanut butter, vanilla, salt, and whisk to incorporate. Pour mixture over the Special K and using a spatula, stir to toss and coat evenly. Turn cereal out into prepared pan, lightly pressing it with a spatula; set aside while you make the topping. Topping – To a medium microwave-safe bowl, add the chocolate chips, butter, and heat in 3o second bursts until chips and butter have melted and can be stirred smooth. Turn the chocolate topping out over the cereal, smoothing the top lightly with a spatula to distribute it. Evenly sprinkle with the sprinkles and allow bars and chocolate to set up before serving, about 2 hours. If you’re in a rush, you can put the pan in the fridge to save time. Bars will keep airtight at room temp for 2 weeks and in the fridge for at least 1 month. I love scotcheroos but haven’t had them in quite a while. They have it all–texture, PB, chocolate and that hint of caramel from the brown sugar! Me too…you can’t go wrong! Have a great weekend! I grew up with these and they continue to be a family favorite with my son! 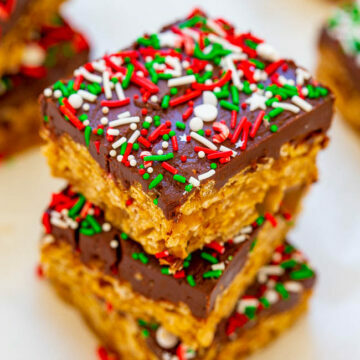 The only thing we add is a bag of butterscotch chips to the chocolate for the topping – I’ll have to try the sprinkles this year, makes them looks so festive! These were a hit for the Christmas party for teens that I supplied snacks for yesterday! 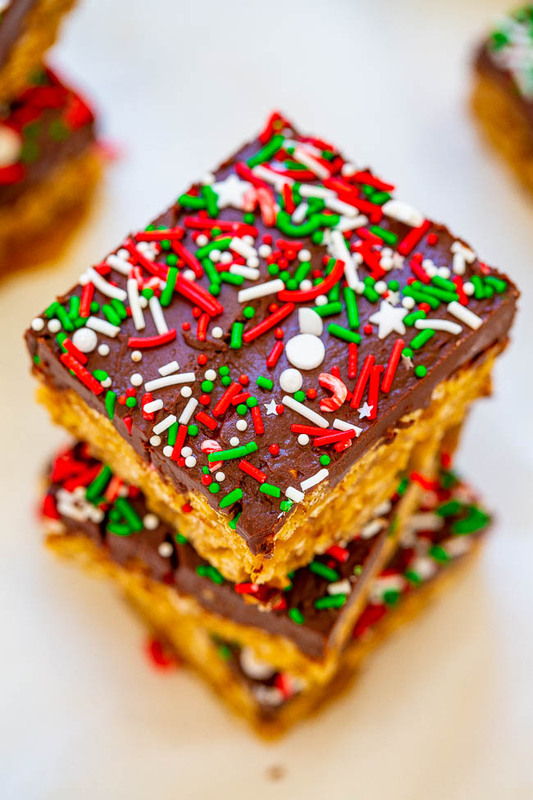 This is one of those flexible recipes–different seasonal sprinkles can be used, or as Heather mentioned, butterscotch chips mixed with chocolate would change up the flavor profile. Thanks! Thanks for the five star review and I’m glad these were a hit with the teens at the party! I hope you have a wonderful holiday season!